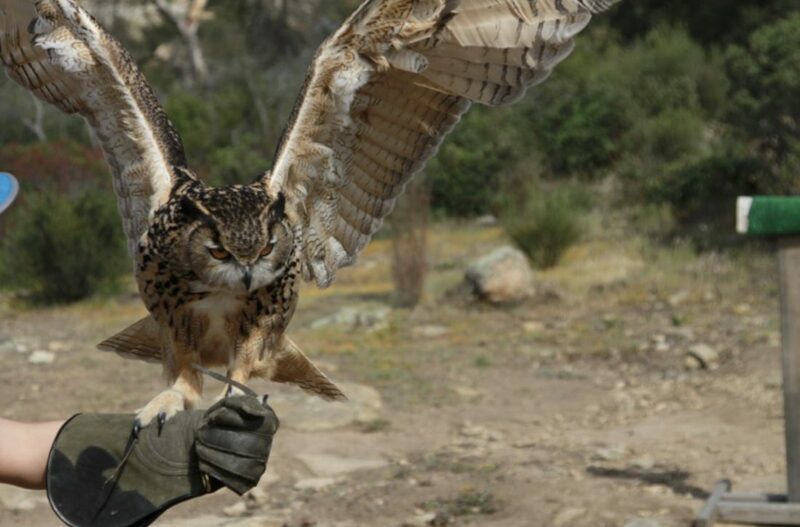 When we are out in the world with our conservation ambassadors, it’s common for raptors like Guinness the Eurasian Eagle Owl and Halley the Saker Falcon to get a big reaction. Birds of prey, especially owls, captivate us on many different levels and have done so for centuries. It brings us so much joy to be able to engage with bird of prey enthusiasts and discovering the kinds of stories that interest Guinness and Halley fans. There are two questions that we hear most often: 1) Can I pet him? And 2) how can I get a pet owl? The first answer is a matter of biology: birds of prey as a general rule do not like to be pet. As primarily solitary birds, most owls don’t typically preen each other in the wild like parrots and other flock birds do in order to strengthen social bonds. Do Owls Like to Be Pet, Cuddled, or Preened? Humans as social primates have a strong evolutionary urge to interact with things in the environment by touching them. As babies, we put just about everything we can reach into our mouths. As adults, there is much that we can convey through touch, from emotion to desire. Nonhuman primates spend about 10-20% of their day grooming each other. Why is this important? Because when we interact with animals that don’t have this same naturally evolved behavior, it’s important to understand the ways that we can develop a trusting, mutually beneficial relationship. In this complex world of survival and competition, how fascinating is it that even the feather structure of birds of prey has evolved so that they don’t need each other to assist with grooming and preening? Can I Get a Pet Owl? To answer the second question about getting a pet owl, it’s easy to see where this idea gets its popularity. Between a centuries long fascination with owls across dozens of cultures and recent resurgence of popularity with the likes of Harry Potter and similar franchises. 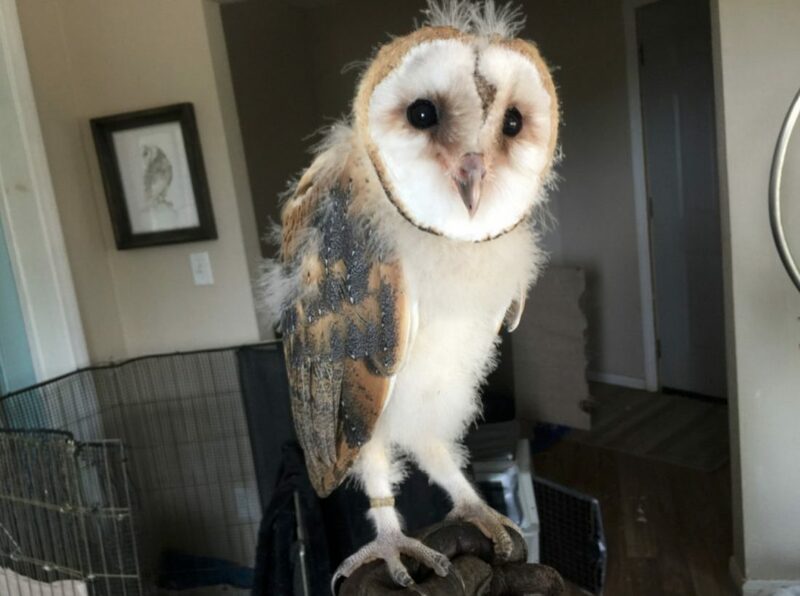 In the US, native species of owl like the barn owl and great horned are regulated by the federal Migratory Bird Treaty Act and keeping one requires specific permits. These could be rehabilitation, education, or falconry permits which require inspections, sponsorships, and sometimes even business licenses. Someone cannot just get a native owl as a pet. Even keeping a molted feather found on the ground is illegal. Many states, such as California, also regulate the keeping of non-native species of owl such as the Eurasian Eagle Owl, requiring education and exhibition permits. In other countries, this may not be the case. But there are many things to consider, because birds of prey are a highly specialized group of animals with special needs that a household cannot meet. 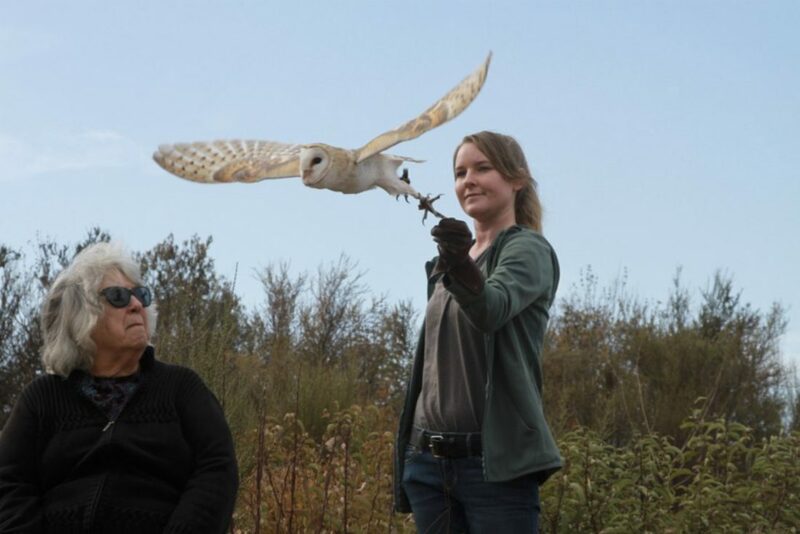 At ABI, we regularly raise owls for as conservation ambassadors. When they are young, they go everywhere with us and are around us constantly for training opportunities. This means they hang out in our offices and drive around in the car to go to outreach events. They might even be present in our daily chores to habituate to strange and loud noises that an education ambassador would encounter out in the world. Once they are fully flighted and feathered and old enough to live outside, out they go to their mews. We don’t want to give the impression that they stay inside in a home environment full time, but do take great care to emphasize the amount of work that it takes to properly socialize a conservation ambassador for all the the stimuli it might encounter in its life. Our previous article outlines the work we do in socialization and early training of our ambassadors. Owls can be challenging to keep, more so than a dog or cat, even a parrot or a horse. They are the true essence of a predator, which means everything from the right housing to handling must be approached with a tremendous amount of care and knowledge. Keeping owls healthy requires a specific kind of aviary called a mews. Mews are large aviaries that offer enough space to fly, have solid walls, and some vertical bars for airflow and sunshine. The way that their eyes work, like all birds of prey such as hawks, eagles, and falcons, is so keenly adapted to react to the smallest amount of movement that they can cause significant damage to their wings, face, and beak if they are held in unsuitable aviaries and enclosures that allow too much visual stimulation or discomfort. Similarly, their legs and talons are designed to grip and not let go, hence the term, raptor: “to seize.” Mesh is not an appropriate material for them, and many floor substrates can make them ill. If they are kept in enclosures that don’t reflect these special adaptations, they can develop serious injuries in a very short amount of time. 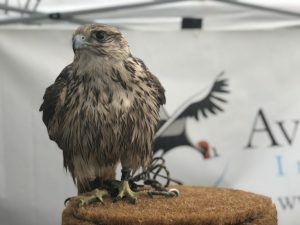 One young red tailed hawk was confiscated by the US Fish and Wildlife from someone who had found a young bird and kept it without a proper permit. The bird had battered its wings so badly that the majority of its wing feathers were torn off, and the bone had chipped away at the tips, keeping it from ever being able to fly again. The bird also suffered from a condition called bumblefoot, in which small scrapes and injuries on the undersides of its feet are left untreated and create serious, chronic infection and inflammation. And finally, the top of the skull was completely defeathered from constant thrashing. The bird was in such poor shape with a terrible prognosis that it had to be euthanized at the early age of two years old. While this is an example of extreme case, there are plenty of scenarios like this that abound. The talon-eye coordination of owls has a very short circuit. This means that owls don’t make a lot of quick calculations in order to get their prey. They see, swoop, grasp, and eat. In fact, the way that their feet and talons work is designed to expend as little energy holding on to their prey as possible: once they clench their talons down, the tendons in their legs ratchet their feet shut and they are no longer using much energy to grasp their prey. This is what helps raptors be such successful predators, but they are often grabbing with lightening quick reflexes, and it’s not always prey that they are grabbing! Hands, faces, pets, and household items are all on the long list of things that can cause mayhem (at best) when grabbed by a raptor. When they become sexually mature, they may become enamored of one human handler and attack others that it perceives as threats. It can be very dangerous with its talons. Owls are strictly carnivores and messy eaters at that. In human care, they need a varied diet of frozen, freshly thawed mice, rats, rabbit, quail, chick, rabbit, and other rodents. Like other birds, they will often hide their illnesses until they are very advanced. It takes an experienced raptor handler to recognize the earliest signs of trouble. Finding a veterinarian that has experience with birds of prey can be a challenge. Owls are susceptible to aspergillosis, West Nile Virus, frounce, bumble foot, vitamin deficiencies when fed an inadequate diet, and a host of other issues. Their care is specialized, to say the least. So, what do you do if you adore owls and really want to take your love of owls to the next level? You can build an owl box for barn owls, as outlined in our blog post here. If you don’t mind getting dirty and aren’t opposed to hard (and often heart-breaking) work, you can volunteer at a local licensed wildlife rehabilitation center. Many people will also invest in a lot of gear and travel extensively to watch birds (and owls) around the world. If you are interested in hunting and are familiar with this type of lifestyle, you can work to get your falconry permit. More on falconry and its influence on conservation in an upcoming article!